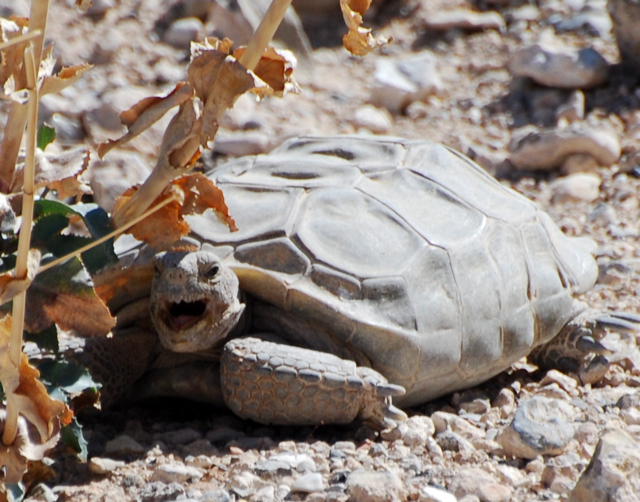 A smile (or a yawn) from Desert tortoise "Lucy" at Red Rock Canyon National Conservation Center (photo by Beth Pratt)Going wildlife watching for an animal that spends 98% of their time in a burrow might seem like a futile endeavor, but followers of my blog will also recall I have shivered outside in 40 below weather in Yellowstone scanning the frigid landscape for wolves. It’s much easier to be patient in the warm sunshine. 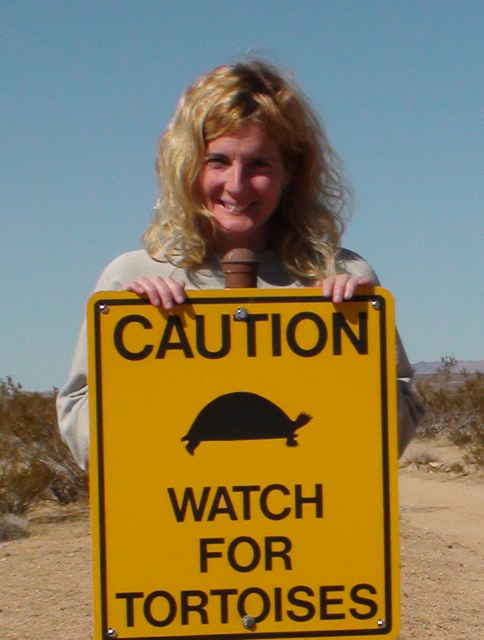 The author at the Desert Tortoise Natural Area (photo by Michelle Hansen)And these critters are worth the effort. Desert tortoises are simply remarkable animals and have existed unchanged for about 18 million years. As a Californian, I am proud of our intrepid little Mojave desert tortoise(Gopherus agassizii) who manages to survive in the driest desert in North America. They dig burrows that stretch for over twenty feet and can hand them down to multiple generations. Their bladder allows them to store up to 40% of their body weight in water in order to access it during the dry season. Since the Mojave receives only 5 inches of rain a year, and mostly in the winter season, this storage capacity is a vital adaptation for survival. My friend Michelle accompanied me on the search and also acted as chief researcher. Our first stop: the Desert Tortoise Natural Area outside of California City, CA. You have to be a dedicated tortoise person to find this preserve, located down a long dirt road and tucked away among the sandy brush scrub landscape. Yet to wander around the nature trails was a delight, and the walk included splendid views of the Sierra Nevada and El Paso Mountains. Alas, we did not sight any tortoises, but we both agreed we had found a wonderful place to explore again. Next stop: Mojave National Preserve. The scenery alone made the drive through the preserve worth the trip, and the surrounding mountains, twisted Joshua Tree woodlands, serene desert dunes, and scrub bush lowlands combined to create a magnificent symphony of nature. When we arrived at the Nipton Hotel for the night (great place to stay when visiting the Mojave), I gazed across the Ivanpah Valley and thought how much it resembled a seascape. The dark lowlands gave the impression of the ocean surface in motion, perhaps the desert’s memory of its once watery origins. Alas, we saw no desert tortoises again that day, but as we sipped wine and gazed at the stars, we both agreed it didn’t matter (well, maybe it mattered a little). The remarkable desert tortoise (photo by Beth Pratt)Our final chance (at least for this trip) was at Red Rock Canyon National Conservation Area. 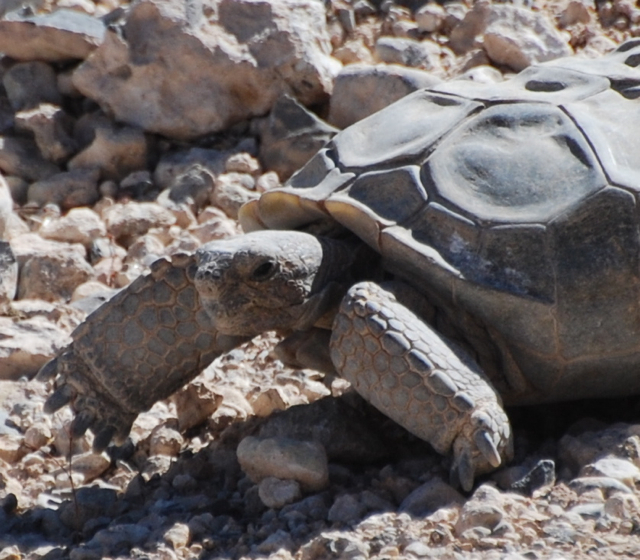 When we first arrived at the viewing area at the Red Rock Canyon Visitor Center, much to our dismay none of the tortoises had emerged from their burrows. So instead we wandered into the Mojave Max education area. Mojave Max is the official spokestortoise for the Clark County Desert Conservation Program. We also toured the exhibits at the center—and I rate it one of the best visitor centers I have experienced—really fun and well designed. Then our moment arrived! We had returned to the tortoise viewing area to find Lucy emerging from her den. We remained captivated by her every purposeful step as she traveled a few feet, her oversized legs moving in slow motion. She stopped—as I am sure even three feet is a marathon distance for a tortoise—and browsed contentedly on some vegetation. I watched Lucy for about two hours—and was well rewarded with a tortoise smile (in truth probably a yawn) before I left. Desert tortoises are to be celebrated, as they are just cool critters. Yet they are also threatened animals. Both the California and the Federal Endangered Species Acts list the Mojave population as threatened, the result of habitat loss and fragmentation, disease, over-predation, human poaching, and invasive species. Renewable energy siting issues have the potential to impact the future of the tortoise. Climate change—combined with the other challenges—also poses a grave threat for this animal, as the increased temperatures may render an already extreme habitat uninhabitable and push the animal to extinction. How can you help? You can symbolically adopt a desert tortoisethrough the National Wildlife Federation or donate to help support our important work in wildlife conservation. But most importantly, your mission—should you choose to accept it—is to embark on your own fun search to see a desert tortoise.